You all know I love frugal hacks, like using Dawn dish soap to kill weeds or using dryer sheets to deter bugs! Well, the other day I was scrubbing some particularly stuck on food off a pot with a Brillo pad, and I thought to myself “I bet this could be used for something else.” It turns out it can! Brillo pads can actually be used in all sorts of ways you probably never thought of. Check out these 10 Amazing Brillo Steel Wool Soap Pad Hacks (including a few tips on how to make those Brillos last longer)! By the way, this isn’t a sponsored post, I’m just a fan of how Brillo pads make cleaning easy. But if you’re more of an S.O.S. or store brand steel wool soap pad user, that’s fine. I imagine the majority of these tips will work the same with other brands. 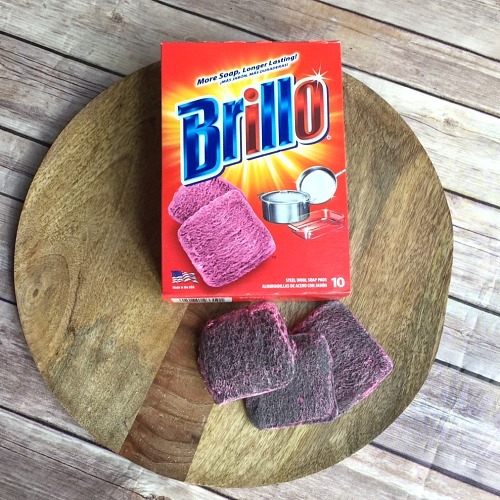 There are so many clever ways to clean using Brillo pads! But don’t get too carried away with these Brillo steel wood soap pad hacks. Just as Brillos can do a lot of good, they can also do a lot of damage. Don’t use them on wood floors, stainless steel pots, plastic, porcelain (like toilets), or painted surfaces if you don’t want to risk scratching them up. Also don’t use them on your car’s headlights or tire rims. While a few people have said their headlights/rims turned out shiny, a lot more have said they turned out dull and scratched up. Which brings me to my main caution about Brillo pads- they’re strong. So when using them, scrub gently. Also always remember to wet them first so the soap will be activated, and don’t use them when their soap has run out. The soap helps act as a buffer between the steel wool and whatever you’re cleaning. Without the soap, you’re essentially just using pure steel wool, which may be too abrasive, especially if you accidentally scrub too hard. To be safe, always test on a small area of whatever you want to clean first, both to check that the Brillo won’t be too abrasive, and to check that the soap won’t leave a stain. 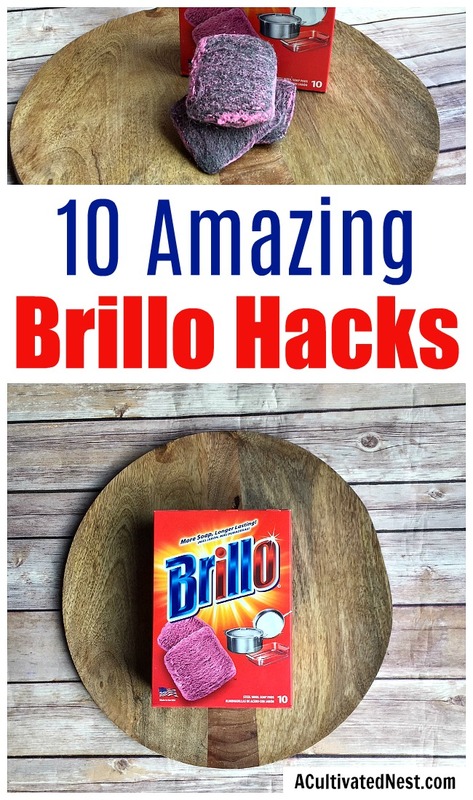 Now with that out of the way, here are 10 awesome Brillo hacks for you to try! Believe it or not, Brillo pads are actually not so abrasive that they’ll damage glass! So you can use them to clean your windows, shower doors, mirrors, and other glass surfaces that don’t have special coatings. Just don’t use them on your glasses! 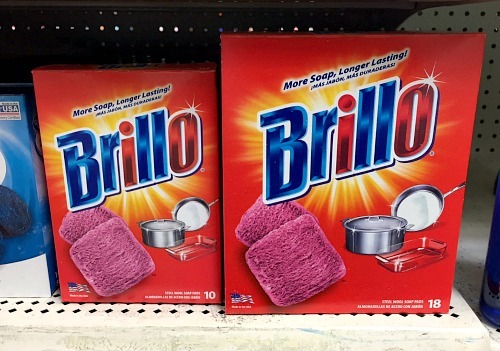 And the Brillo website says you should only use them on glass as long as there is still soap in the Brillo. If you have rust on chrome things in your house, or even on metal tools (like hammer heads and wrenches) scrub them with a Brillo pad! With chrome fixtures, scrub gently, but I imagine metal tools can take heavier scrubbing without much risk of damage. Are your faucets too stained for our dryer sheet chrome faucet hack? Then try a Brillo pad! Just scrub gently and your faucets will be shining in no time! A really frugal Brillo hack that we’ve been using for a while is to cut each pad in half. They work just as well cut in half, but you use less each time. And really, most jobs only require half a pad. And if you don’t use the whole half pad in one scrubbing job, you’ll like tip #8! If your oven racks are beyond the self clean feature’s cleaning abilities, and you don’t feel like scrubbing for a while with baking soda, clean them with a Brillo pad! You can even clean the drip pans with a Brillo pad! This is one of the most clever Brillo cleaning hacks I’ve come across! You can actually use a Brillo to remove crayon from your wall, but you should lightly rub in a single direction instead of doing circular scrubbing. Also, all wallpaper is not made equal, so I’d test this in an inconspicuous location first, both to check the Brillo doesn’t scrub the wallpaper off the wall, and to check that a damp towel can wipe away the Brillo soap without leaving a stain. If you don’t want to risk it, you could always try our dryer sheet crayon hack instead. Tired of looking down into a brown stained coffee mug? Just gently scrub the inside of the mug with a Brillo pad, and it’ll be clean like new! You could also use this tip on the outside of the mug, but I wouldn’t use it on any artwork/lettering, in case it scrubs it off. And since mugs are not all made with the same sort of coating, I’d always test this on the mug’s inside first. If you have some of a Brillo pad left over from your last Brillo hack cleaning project, you don’t have to throw it away or worry about it growing rust. Instead, just wrap the pad in foil, put that in a baggie, and stick it in your freezer. We’ve been doing this for years, and it’s a great way to save on Brillos! 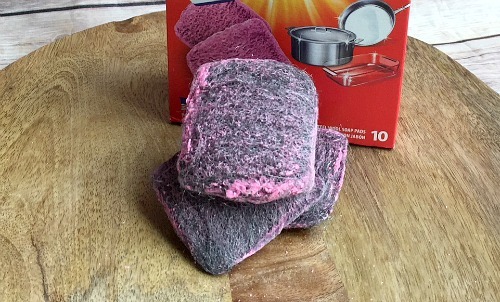 This Brillo steel wool soap pad hack is something I don’t think many of us would have thought of, but it seems so obvious after you read it- scrub down your outdoor garbage cans with your Brillo. It’ll get rid of grass stains and water spots, plus scrub away smells! If your outdoor cans are actually plastic bins, scrub gently, and test this tip in an inconspicuous location first. There are so many smart Brillo pad hacks out there! Another one to try is to use a Brillo to clean your grill’s grates. Just scrub gently so you won’t scrub your grill’s nonstick coating off. Aren’t those some wonderful Brillo hacks? Whether you’re just trying to clean a stubborn stain, or want to know what to do with the leftover half of a Brillo pad, these tips can help! And since Brillo pads are so inexpensive, using these cleaning hacks instead of buying other cleaning products can help you save money! Have you ever tried any of these Brillo pad hacks? How did it go for you? And if you have a tip we missed, let us know in the comments!